If there is a Christ in me, how did it get there? The True Christ and Other Studies in “Whatsover Things Are True” is a book coming straight out of mainline Christianity, published in 1910 by a Congregational minister in Scotland. I was sure that it was a New Thought or Unity book when I picked it up back in 2012 at a used bookstore in Austin. It has taken me six years to understand what Christianity looks like when it is free from Catholic and Evangelical constraints. “Whatsoever Things Are True” is a phrase from Phillipians 4:8. Paul wrote to those Greek people in that Greek city who knew deeply from their Greek world perspective what he meant by “whatsoever is true.” True things are honorable, just, pure, pleasing, commendable, excellent and worthy of praise. These are ideas—what we in Unity refer to as Divine Ideas—that did not originate from Jewish tradition but rather from the rich spirituality of Greek metaphysics. Jesus used them. So did Paul. And John, and Augustine, and Meister Eckhart, and Erasmus, and Emerson, and Charles Fillmore. As do we in Unity today. So what we have here is a book, not of Catholic Christian theology, nor Evangelical Christian theology, but rather of Metaphysical Christian theology. It’s author does exactly what Jesus, Paul, John, Augustine, Eckhart, Erasmus, Emerson and Fillmore did—convey the eternal Truths of Christian theology using concepts taken from Greek metaphysics. If you, like me, are attracted to Metaphysical Christianity and have a sense that Metaphysical Christianity is a distinct and authentic branch of the historic Christian church, then this book is the smoking gun. Is this Christian? It’s not Evangelical Christian, but it’s as Christian as Jesus and Paul and John and all others to held that Truth is supreme and that His Truth is Marching On. The PDF is downloadable below. I have transcribed the first of several sections that I intend to publish here and I have added commentary. This one is about how it is that God become an incarnate Christ in the person of Jesus. I’ve chosen it because it also describes how God is becoming the incarnate Christ in each of us. I hope this book blesses you as it has blessed me over the past six years. 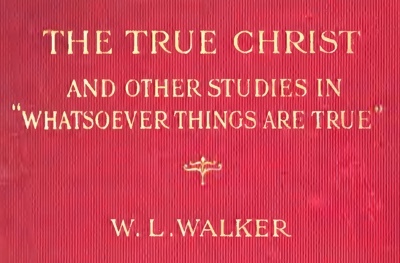 Download a PDF of WL Walker The True Christ published 1910.